They said it was a powerful moment of modern feminist independence as Meghan Markle walked alone down the aisle. But all I could think of was how profoundly it reminded me of Cinderella. The bride presenting herself with dignity, beauty, and a pure heart, to her prince. For that matter, it made me think of the earth after night, rising to her sun, becoming luminous and warm with his light - the goddess coming before the god, the soul before the divine. That bride entering alone into the church was sacred; she was all of us approaching Love. The sight of her touched something deep in my soul. 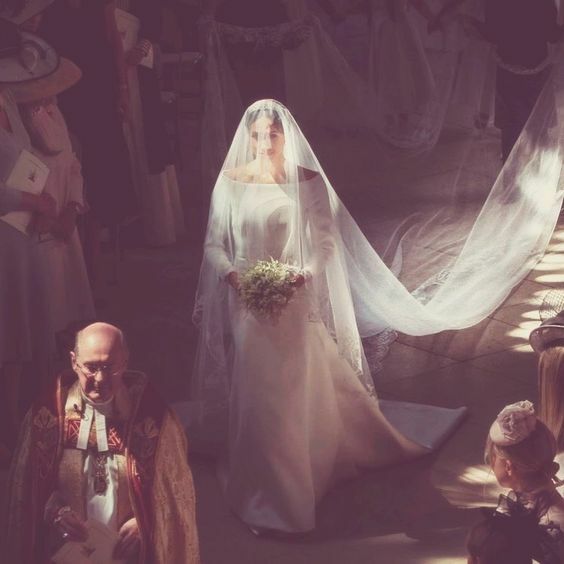 When I first heard that Meghan was going to walk the aisle alone, I felt a little disappointed - for I love tradition, and this seemed one step too far towards modernity. But when I saw her enter beneath the roses, my heart swooned at the romance and feminine magic of it. For that moment, she was an image of the fairytale heroine, having gone through her own dark woods, hurt by her step-siblings, abandoned by her father, and yet so strong, brave, luminous with love. The wedding was of course also a happy-ever-after story for the fairytale sad prince, and there were moments that made me cry with joy for him, just as I did for William at his wedding. So many people have negative things to say about the royal family but I am grateful for the way they give us, through their sacrifice to tradition, history, and duty, a living loom of story. A reason to share happiness as a community, and tears, and love. But most of all I was transfixed by the heroine of the tale, the bride. If women want examples of female agency and power, they could do no better than to look to the old-fashioned fairytale princess. Yes to all of this. And that photo! The sunlight on her as she walked along...just one bit of the beauty and passion and goodness expressed in the ceremony and between so many there. Inside and out. I rewatched it after a nap this morning and feel such sadness for all of the negativity and unkindness I understand is bandied about by many around these people who give so much. I must read and listen and visit in careful circles to have missed most all of it except a bit that was shared with me. Yet I also know what is going on in Yemen, in response to your truth-speaking yesterday. It is sad to me that she is walking alone, but it is also simple and sweet and...hopeful. Can I add a bit more? I think that is a good thing. I loved the symbolism in her beginning her walk alone, and then she was met and accompanied the rest of the way by her soon to be father-in-law. I found that so moving, such a powerful moment — 'Welcome to our family!' It was beautiful. Thank you all for your lovely comments :-) It has been so nice sharing this with you.